FROM ROLAND GARROS — As Novak Djokovic says, it’s a big challenge. On Monday he beat Rogerio Dutra Silva in straight sets. The Serbian played pretty solid and, when he had an opportunity, he swung at it a little bit harder. Djokovic is improving, slowly. He knows that gradually, he will be back into the top form. Will it be this week, or next week? No one knows, but if you saw that Novak played against Rafa Nadal in the semis of Rome two weeks ago, he was pretty close. He didn’t win, but he was steady and he mixed up his shots. He also went for it, here and there. “A relationship that is based on pure love and passion. 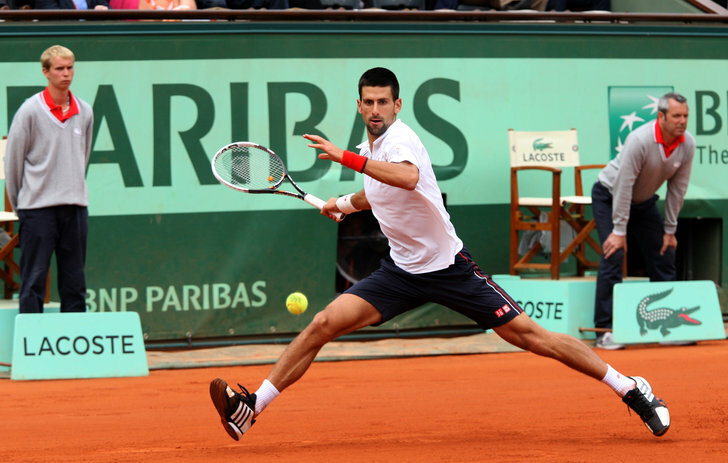 As long as I feel like I’m supposed to play, I’ll play,” Djokovic said. “If, at the moment, I don’t feel like playing, I will not, and I don’t feel obliged by anyone but myself to be on the tennis court. I just try to remind myself why I started playing this sport, and that’s where I draw a lot of energy. It’s a challenge. I’m not the first one to, first player in the history of this game to face these kind of circumstances with big injuries. [Juan Martin] del Potro comes to mind. He’s someone that has faced even worse challenging circumstances with two, three years, couple surgeries, coming back, playing, not playing really well, and then having to retire so many times. And now he’s, back to top 10, top 5 of the world. That’s impressive. Those kind of stories inspire you, and hopefully I can do the same.” Djokovic will face Jaume Munar in the second round. German Andrea Petkovic won a terrific match against Frenchwoman, Kristina Mldaenovic. “Petko” has really struggled over the past two years, because she lost her confidence. But on Monday, she shook her head, she ran quickly, she mixed it up, and she found her range. She may not win the tournament, or even going very far, but the 30-year-old did reach No. 9 in 2011. Five years ago in RG, Petko reached the semis, beating Mldaenovic — again — Kiki Bertens, Sara Errani, and then she finally lost to Simona Halep. But in the past couple of years, she slipped, a lot, and pretty badly. She played almost every week, but she lost very early. Maybe she should have gone home and rest, for a month or so, to recharge, but she didn’t. So now, she is ranked No. 107. Will she be able to play well during the week? That is hard to say.